My name is Martin SCHÖNWITZ, I have been born in 1960 and working as Computer Science Cunsultant in the computer business. the occupation with my family name SCHÖNWITZ starts first in 1985, when I was a student at the University in Paderborn (Germany). I found out that there is another family with the name SCHÖNWITZ in the same town. My curiosity about that has been awakened and I establish contact with that family. It turns out that this family has his roots in Silesia beneath Oppeln (pol: Opole). Around this time, my father has received some old documents from a distantly related aunt (her maiden name was SCHÖNWITZ). After reviewing this documents, it was possible to track the family tree 7 generations back. "Our" family tree has his roots in Karlsmarkt (Pol: Karchow), wich is not far away from Opole. But they seem not to be conected with the "Paderborn Tree". Because of that occurences, my father decides to start his own research. He took some telephone books from the area around Cologne. He founds out that indeed there are some more families with the name SCHÖNWITZ living here. They are all not related to our family. Some of that families he phoned to and tells them that he is interested in that theme. He asks if there are some old documents, which they possibly could send him. The most interesting paper was from a family SCHÖNWITZ in Brühl beneath Cologne. A copy of a written record tells something about the family and the name SCHÖNWITZ. Specially a village SCHÖNWITZ beneath Oppeln was refered to. The writing of my diploma thesis prevent me from continuing my researches for a longer period. Also my father "finishes" his researching activities. After my studies, about 1995 I reinforce my activities in ancestry research. I found out, that on a telephone number CD were about 170 families with the name SCHÖNWITZ in Germany. These CDs are public available as an attendance list and deliver name, telephone numer and address of each person. From this time, my enthusiasm was awaken again, and I whnt to find out if all these SCHÖNWITZ have something in common, and if there is some "promogenitor" SCHÖNWITZ from the village SCHÖNWITZ. First of all, I provide some software for family research, for better storing all knowledge and print fine lists, trees etc. As primary foundation of my researches I use the old documents of the aunt, which my father gives me. In combination with the 170 adresses / telephone numbers, I begin to call and write to the different SCHÖNWITZ in Germany and start to research their family history. The copies of the old church books of the LDS bring up a lot of more entries of families SCHÖNWITZ. Now I have to put the puzzle together. 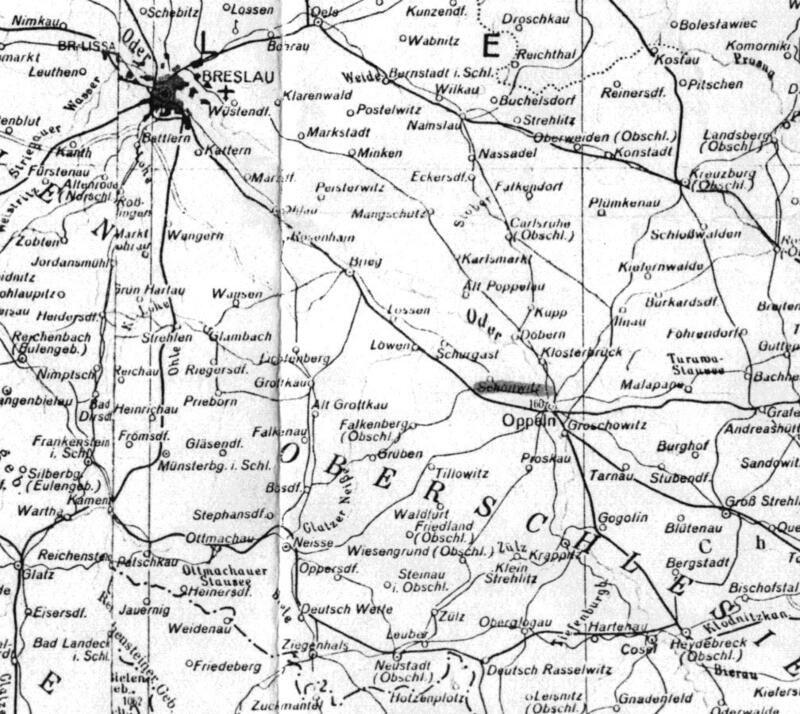 Meanwhile, I have found out a lot of interesting things about Silesia, about my family name, about the village with my Family name. and I have found a lot of friends and interesting people which I have talked to or which I have written.I want here to thank all people, which have helped me in my resarchs in past and still now.